What in the world happened at that Pacquiao fight? What does this mean about the future of boxing? What was it like in the arena after the result was announced? What happens to the Celtics now? What do the Thunder need to do offensively? 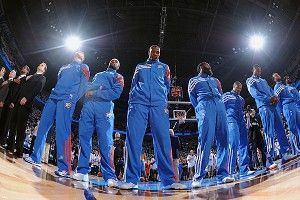 What do the Thunder need to do defensively? What do the Heat need to do offensively? What do the Heat need to do defensively? Oh yeah, he also gave his Finals prediction, and both of his Conference finals predictions were right. Enjoy the show and check back next Monday, when we will be recording from Miami. Listen to Monday’s podcast here.